Waiting for my dear wife Karen to open together. Just this morning I received an email from my dear BloggyVille friend Rachel, putting me on alert that she’d put the prize from her Could Do Worse: Adventures in London anniversary sweepstakes in the post. A bit back Rachel had noted how she’d been publishing her words and photographs here for several years, and would therefore celebrate by putting the names of all who commented on said story in a hat, pulling one out, and sending them a prize. That’s not why I clicked the comment box. I sent my congratulations, respect and admiration, as I’ve done regularly since we began following each other way back when. She’s good, traveling around her London world and sharing images and thoughts of landmarks, not to mention cooking and the arts and the act of living and raising two teens with her husband Steve. She’s my kind of person. Click the link above, and you’ll see what I mean. Lo and behold, she drew my name out of that hat. Fair and square. Today’s email — yes, we are real-life friends now who can’t yet meet in person, all these miles and all that water in between us, but can send off-the-grid messages of support and encouragement about inevitable peaks and valleys — warned of how the packing of said prize warrants special care while taking it out of the box. The carton above arrived with the mail this morning, addressed to Mark and Karen, from Rachel and husband Steve. The international labels surely will be saved by me. I hope you don’t mind my blurring for privacy’s sake. I mentally pronounced the operative word in the last sentence with a British accent, getting even more stoked. Yet I shall wait until my dear wife returns home from her job at SMG, and we will proceed with care. Look for an update tomorrow … providing we get through it unscathed. 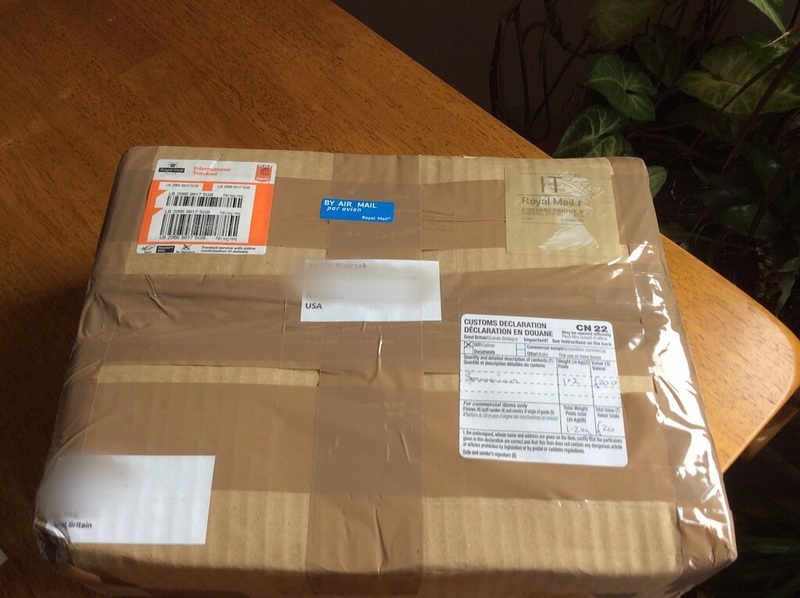 Have you received a mystery package, and if so, what did it end up containing? Have you won a BloggyVille contest, and if so, from which blogger, and please supply the link. What do you think is inside that box? It’s not ticking or buzzing in any way, Paul. 🙂 No smells. Can’t you take just a wee peak and then re-tape it? I understand, and thanks for the spelling correction – I typed that comment too quickly! Thanks, Amy. I think it’ll be worth it! I was wondering how they got it to you with all the addresses rubbed off. Magic labels. They appear and disappear at the snap of the fingers. Mine! Me, too, Donna. It’s going to be exciting! I think I may be more anxious than you are Mark! It’s hard to see the dimensions of the box from the photo but I’m going with a book or a picture/photograph. You’ll have to let us know. I recently won a Metallica bio from a blogger who does book reviews ( a lot of music ones ) therealrene. Oh yeah, I couldn’t really see the height of it that well. Don’t break it when you shake it, ha, ha! mark – first, thank you for your kind words – you are a good friend. Second – i do hope the contents of said package doesn’t disappoint. Finally, can’t quite believe i emailed you just in time!! Oooh! Yes I have! Several years ago an ENORMOUS box was delivered to me from my friend Tracey in Alberta. (She is an online friend, too.) I had to push the box through and it barely cleared the doorway! I began opening it immediately, as the box instructed. It was a refrigerated shipment of Godiva chocolate! Very cool, Mark … Rachel is a kind and giving person. I’ll vouch for that. Yes, she surely is, Jim. Lucky us to be her friends way over here. I have received many packages over my lifetime but none which were a prize. So, this is me holding my breath, well at least for a few seconds. . . smiles and will check back tomorrow, Mark! Thanks, Robin. I will do a good job on the big reveal, my firend. I promise. congrats and i’m so excited to see what’s inside! Thanks, Beth. It’s a great reveal! Reveal to come tomorrow morning, Wormy. Edward will have to wait. I know he wants to slice it open right off. How exciting! I look forward to the reveal, Chum. Congrats, by the way! oh no – it is not you Mark – I just changed my blog stuff again – ha! I did see that particular gravatar photo at least once before, though, Y. I have to be on my toes, you know? You too. I’m so glad spring is here at last. Are you into the Rockies like you are the Broncos? No I am not a baseball fan. But it is funny you mention “spring.” I just wrote a poem about that season that I am posting now lol. Mind read much? Great minds move in the same direction, man. I’ll come take a look. 🙂 I am sure you are a safe guy!! It’s a big reveal, Rachel!